"So where are we this time, Professor?". Ace spoke with a quiet voice, she was in severe need of some sleep. "No time to explain, follow me..."
"What are we doing here, Professor?" "Come along, we'll be late." "Someone needs our help." So, what's new? Ace thought. "No one you know, well not yet anyway." "Why do you never tell me anything?" "Stop asking so many questions, Ace!" She followed him to the roadside, and waited impatiently as he fumbled in his pocket. After a small struggle the pocket gave up the Doctor's watch, which he fumbled with until it opened. "Well the time is right, this is where he should be." "This is where who should be." "Oh, well, I suppose it doesn't really matter. It's just that if we could have fixed the car he wouldn't have had to go to the petrol station..."
The Doctor's voice trailed off into nothing, he was staring at the cows in the field. The cows just stared back, decidedly disinterested. "Was this another one of your little missions, putting pawns in their place, pushing people off of bicycles, that sort of thing?" "Perhaps I'll get around to it earlier, or do I mean later. Perhaps I'll meet him before he got here, and stop myself needing to bother. The flow of time is immensely difficult to put into words." Getting tired of his chatter, Ace grabbed him and pulled him around to face her. "Doctor, what were we going to do here?" "Tidying up Ace, Spring cleaning, call it what you like. When you travel as much as I do, you can't help but make a mess in places, tie knots in the fabric of time. It's like the school of thought that says if you witness a crime and don't report it, you could almost be considered an accomplice. I have to untie knots, put the pieces back straight. It's the price of travelling as I do." "Then why do you? Wouldn't it be simpler to settle down, rather than spend half your time tidying up after yourself." "It's the old question, How long is a piece of string? Why do birds sing in the morning? I travel because it feels right, because I see things that need doing. Anyway, I have a responsibility to clean up after myself. Leave the Universe as you would like to find it, Ace, that's all anyone can ask." With that, he turned and wandered back to the ship, Ace followed him at a distance she was too tired to move quickly. No convoluted explanations, no complicated answers. She was disappointed, the Doctor hadn't given away any great secrets, just told the truth. Half the time he did things because he thought they were right, and the rest of the time he spent tidying up the mess he had already made. They entered the TARDIS and departed. 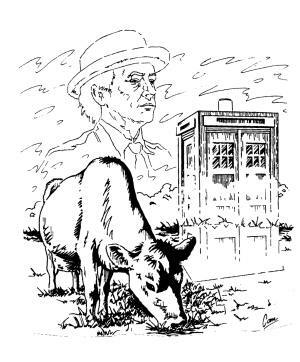 The cows ignored them, they had no interest in the affairs of a busy Timelord and a confused human. Chewing grass, now that was interesting.